An unusually compact and elegant Chamber Organ dating from circa 1800. 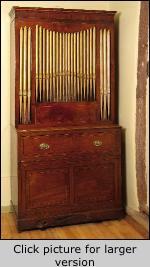 The case is mahogany with boxwood and ebony stringing, the front panel having 25 giltwood pipes. 221.6cm (87”) tall, 111.5cm (44”) wide, 58.3cm (23”) deep. 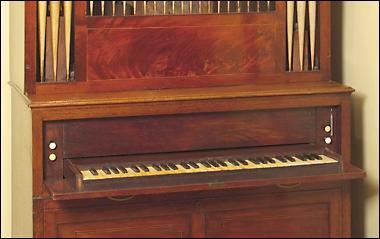 The compass is C/D to c4 with ivory naturals, ebony accidentals and mahogany key fronts. The folding keyboard tilts outwards, lying on its drop front, to the right of which there is a brass telltale. The stops are wooden Stop Diapason and metal Principal, divided. This very elegant instrument survives in a remarkably unspoiled state and has retained its original pitch, tuning and voicing.